As our family prepares to head out to the Philippines next Wednesday for a three-week survey trip, I hope you will take time to visit a new page (“Support“) we’ve added to our website. We are stepping out in faith, a bit apprehensive, but very excited to see how the Lord will provide for all of our needs. I do not have all of the answers to the dozens of “how’s” that pop into my mind about how this will all work out financially, but I am confident that God will take care of our family. If you would like to have a part in giving to support the work we have been called to, please check out our new page titled, “Support” (Click Here) to find out how you can partner with us! While Sarah and I worked with Katie to create this prayer card I often asked myself, what is the purpose of a prayer card? Of course, the first word that naturally comes to mind is “prayer.” I hope our prayer cards will remind people to pray for us and the ministry God has called us to. I hope you will look at the sweet faces of our children and remember to pray that they will thrive in the Philippines. I hope you will see the faces of a couple that need your prayer as they experience the greatest changes their lives have ever known, and that during the change they will remember to love and serve one another. But in thinking about this prayer card, I came to realize that my hopes for it go well beyond prayer. This is not to minimalism the importance of prayer, but I think we all recognize that prayer is often not an end to itself. Prayer is also a powerful motivator to action. We pray about things important to us (and things important to God). As we pray, our burdens often grow deeper and in turn our desire to effect change in that particular matter grows deeper as well. So, as you use this prayer card I hope it will ultimately turn into an “Action Card.” I hope it will be a reminder for you to touch base with us, support us, or encourage us. We are very thankful for the many family and friends who have reached out to us already as we begin our journey, and we look forward to the encouragement we will receive in the coming months and years as we continue along the path God has laid out for us. And I have a hunch that this “Prayer & Action Card” will have a big part to play in God’s encouragement to us along the way. The month of August marks the “launch” of countless new endeavors for the Valiantes. We are officially beginning the process of raising support to enable us to help with the launch of Haven of Grace Seminary on the island of Negros in the Philippines. With the start of deputation, we are also “launching” our new website. I hope this website will be a helpful resource to keep you up to date on what is happening in our lives. We are excited to see all that the Lord has in store for us, and trust that He will continue to guide us in the future, even as He has faithfully guided us in the past. Please take a moment to browse through our site. 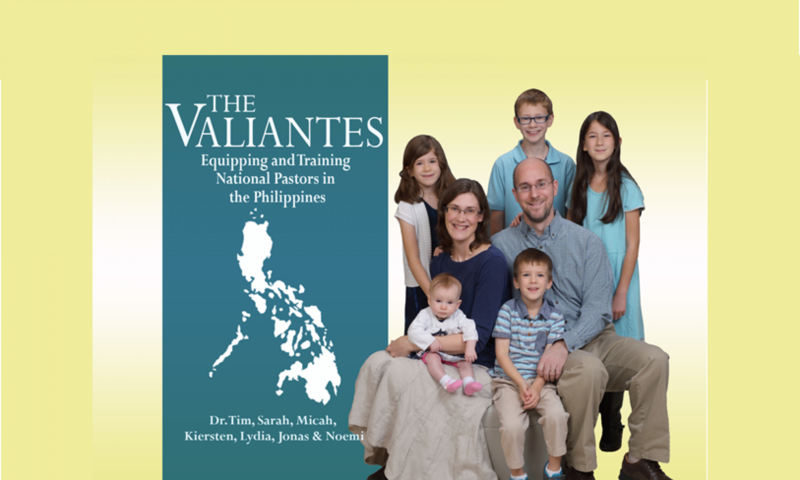 In the coming weeks we hope to add more pages with additional information about our ministry in the Philippines.